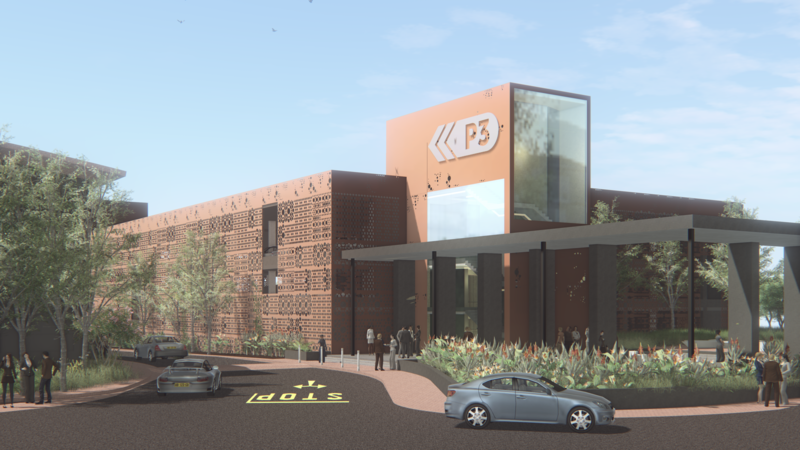 Comprising five levels of parking, which include a basement, three regular levels and a roof level, P3 will add 324 additional parking bays to the precinct. With a clear vision of P3 not being just another parking deck, an essential design objective was to include eye-catching lines and appealing design features. This not only ensures that the building is complementary to the remainder of the superbly designed precinct, but builds on Century City’s commitment to use art and points of interest across various developments to enhance the experience of all users. Vivid Architects designed a randomly perforated aluminium cladding system as a façade across the building, which creates an exciting feature and allows for natural ventilation to the parking decks. The unexpected design aesthetic continues with the circulation staircase on the corner of the building facing Century Square being fully glazed, set off by black, red and yellow tiled walls on the external façade. A pocket park will be created at the pedestrian entrance and exit. Century City prides itself on its Art Trail, which includes over 30 art installations of various sizes. The intention is to showcase another art treasure in this “green” space.